For the past several weeks, I’ve been mulling over ways I might be able to more actively promote blog and site content that I dig. Blogrolls, while succinct, don’t really put recommended reading into context. My efforts to champion the great and relevant work of others who share similar cinematic interests will be a running feature going forward, but a recent development has given me a starting point. Fist of B-List was called out as a recipient of the Liebster Award by my very good friend, Aaron of The Death Rattle. In addition to his work there, he’s also El Jefe for The Gentlemen’s Blog to Midnite Cinema, so in short, he’s one of the hardest-working dudes in genre film coverage. Be sure to check out his written work as well as his terrific guest appearance on The Gentlemen’s Guide to Midnite Cinema podcast, where he, Big Willie, and the Samurai covered the first two Howling movies. It will put hair on your balls (and probably your back). Those who receive the Liebster Award are charged with passing on the achievement to five other blogs of their choosing, but each must have less than 200 Followers. There were plenty of folks I wanted to call out for their excellent work, but it seems only blogs that display their Followers gadget are eligible. So here are five that meet both criteria: having less than 200 regular readers, and being awesome on the regular. 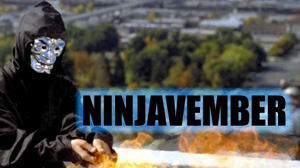 The Ninja Squid - An awesome gal who features her art work, perfect screen captures and captions for films, and unbridled love for martial arts and Anthony Wong. A million times, yes. Ninja Dixon - There’s always room for another blog with “ninja” in the title, especially when it features great writing about genre cinema from around the world. Video Junkie Strikes Back from Beyond the Grave - Need proof that we’re blogging brothers from another mother? Check out the running Gweilo Dojo feature. Hilarious reviews of some really obscure cinema. Lone Wolves and Hidden Dragons - The two authors have other blogs as well, but you need look no further for your Asian genre cinema fix. When the Vietnam War raged... in the Philippines - One of the most unique editorial concepts you’re likely to find in the wide world of genre film blogging, executed to absolute perfection. Fantastic reading. Wow! Not only do I have a super sweet award, but I now have more cool blogs to read. Thanks to the max! Thanks for the kind words and for pointing me out to some great blogs! I'm certainly glad there's no webcamera at this end cos I'm just looking completely dumbfounded!! What can I say, buddy! That's an awesome descrpition of my wee blog. Thank you so much! I'll try and live up to it in the future as well.